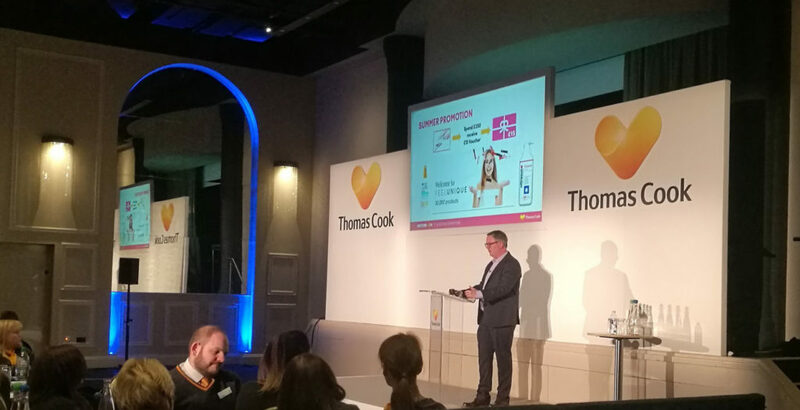 Thomas Cook Staff Roadshows - On Event Production Co.
We were delighted to once again team up with our good friends at the award-winning agency mcm creative to help it deliver a series of staff roadshows for high street travel giant Thomas Cook. We were tasked with building and installing the sets at the firm’s ‘Switched On ‘series of summer staff events, along with providing full event production in partnership with mcm. The three two-day road roadshows – for the firm’s north, east and west divisions – were aimed at bringing Thomas Cook branch staff up-to-date with company news and the latest sales and marketing strategies for the year ahead. They included presentations, interactive staff activities, breakout sessions and an audience Q+A with senior management. The events took place at the Jury’s Inn, in Hinkley, Leicestershire, the Holland House Mercure, in Bristol, and the Mercure Piccadilly, in Manchester. The key challenge was supporting 6 production days in the same week as each event lasted for 2 days. This meant we had two teams of engineers and two sets of equipment to ensure we provided seamless support over the programme. We supplied full video, lighting, audio, set and staging for the events, including a custom built set, graphics, and stage fascias. However, because the three venues differed in size and space, we had to design and create two versions of the same set. One was used first at Manchester, where the venue’s ceiling was high and allowed for a bigger screen. A totally separate set was built for the Bristol event given the size of the room and overlap in scheduling. The final event which took place in Hinckley, we used the same set as Manchester but with a smaller screen fixed at a lower position. Our Production Manager Jake Moore said: “It’s always a pleasure working with mcm creative, who we’ve known for a long time and have worked on many events with. “The production elements of these roadshows were relatively straightforward, but the challenge came in designing the sets to retain the same look and feel whilst being able to scale, as the three venues were all different and had different requirements in terms of the space we had available.